Yosemite is absolutely gorgeous. Yesterday I went on a Valley Tour. Yosemite National Park is in the Sierra Nevada mountains which means, if I remember correctly, mountains topped with snow all the time. We saw El Kapitan which is the largest rock (granite) in the world. The valley is 4000 feet above sea level and El Kapitan is about another 4000 feet and it’s enormous. We saw people climb up it. They only actually looked like dots but the people climbing it take about 3-10 days depending on which way they go. Therefore they have to sleep some time, either on a ledge or suspended on a hammock. I’d be too bloody scared to sleep. …It’s the first time I’ve ever eaten in a restaurant by myself but I was seated right next to the group I’d met. After we’d all eaten I sat with them and talked for a little bit. ….and I was left with the bus driver [of the tour group]. He asked me if I had a boyfriend, then why didn’t I have a boyfriend because I was kinda cute. I hate it when people ask me that. His tour is going to Los Angeles, like me, and on Saturday they are touring Beverly Hills and Hollywood and he asked me to go along which I will. I know, I’ve rewound time slightly. I went to Yosemite before I went to Key West and the east coast. I decided to include this one as it was so gorgeous as I mention above. I was captivated by El Kapitan. 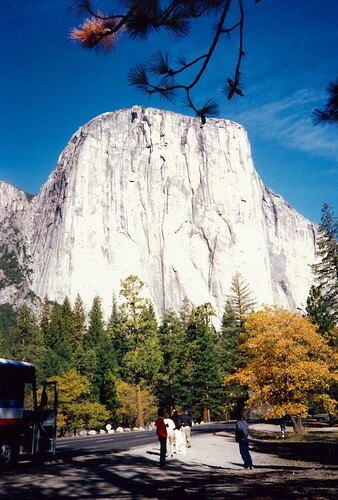 (Click on photo above to see more of Yosemite). I only went to Yosemite after a suggestion from some friends I stayed with in San Francisco. It was lonely being in a place like this by myself. It was more suited to the tour groups, couples and families. I had a lovely cottage all to myself though, and it was a bit decadent especially as I was supposed to be backpacking. I didn’t write in my diary as to why I didn’t end up going with my bus driver but it didn’t feel right, especially as everyone else on the bus would have paid and I would have just been a hanger on. I’m sure it wouldn’t have been above board and another kind of payment might have been expected. I ended up catching a bus from Yosemite to Merced and getting a cheap hotel room to wait it out there rather than at a bus station for a 4am bus trip to Los Angeles. It wasn’t that far to walk to the bus station which was really stupid of me especially as I got lost. Luckily I found some guys doing up a shop at that time and when they realised I had luggage one of them gave me a lift to the bus station. I made it to Los Angeles safely. I have funky memories of Yosemite. Some very pleasant and peaceful, and others including my flu-ridden father and a severely infected surgery wound on my leg.